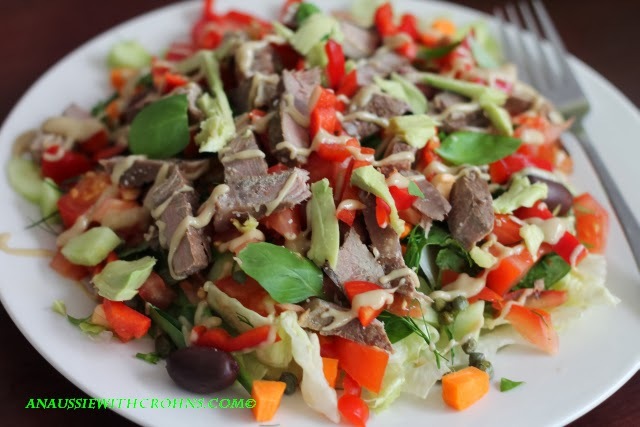 This salad is my favourite meal of the day and probably my favourite food to eat. Everyday when I eat it I say something like, "Yum! I just love food!" My poor kids are sick of hearing it. At work, I take a smaller version in a Tupperware container. I've found that my body just loves this salad. It is so fresh and full of wonderful vitamins and minerals. Cooked veggies are wonderful, but I truly believe we all need a big salad once per day. The beauty of this salad is that it's always different. I've listed what was on my salad today, but any combination of salad ingredients, vegetables and protein is great. Don't forget to include some good fats to keep you full. I add olives and tahini everyday and often avocado. Layer the ingredients, in the order listed, onto a large dinner plate. 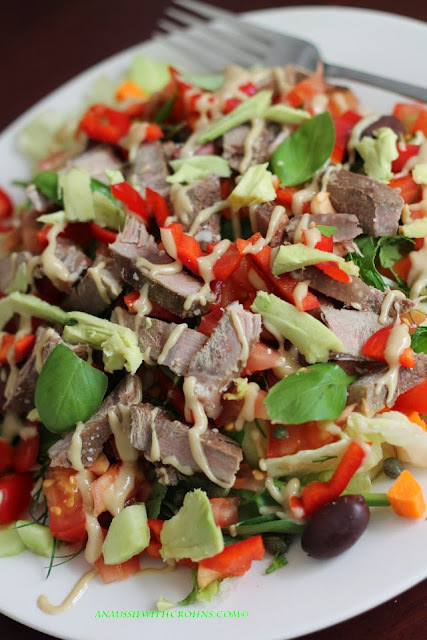 Lastly, drizzle the tahini over your salad. I've been eating different versions of the salad for quite a while now, but have only recently added the fresh herbs. I'm so glad I did, because they give so much flavour! I've now planted herbs in my veggie patch so I have an abundance to add to my salad each day. Mark Sisson's 2 minute salad video. Have you dropped by and said 'Hi' on Facebook? Or go to my widget on the top right hand corner of my blog to sign up for updates via email, twitter or G+.